While visiting the Western Front in the Spring of 2008 FFFAIF member Stuart Curry met Johan Vandewalle. Here is the first part of Stuart’s story about his time spent on the Battlefields with Johan. 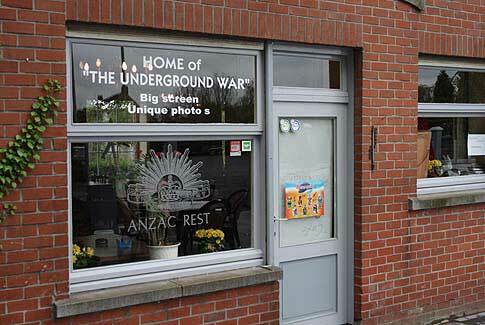 Johan Vandewalle owns a small café called Anzac Rest which is situated at the western tip of Polygon Wood. I was lucky enough to meet him one day at his bar and he was overwhelmed with the amount of research information I had on my family diggers and offered to show me around the area. Johan is known locally and internationally as the ‘dugout king of Belgium’. From the books he has written to the documentaries he appears in there appears to be nothing he does not know about the tunnellers of World War One. 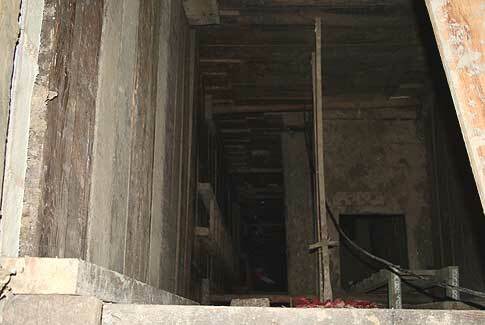 Photo: Looking down into Vampire Dugout, a project of Johan’s. With my interest in Australian Field Artillery the first place we visited was a position on the reverse slope of Westhoek Ridge. Photo: View from Westhoek Ridge towards the village. 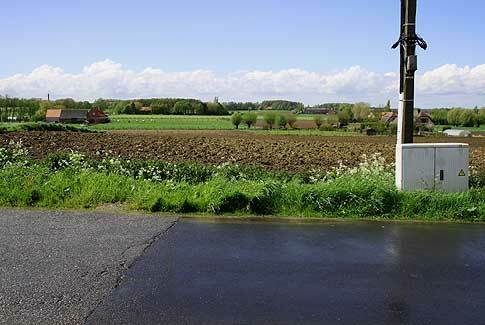 It was from this position that the 14th Machine Gun Company was engaged in the Battle of Menin Road on 20 September 1917, helping the 2nd Division with their creeping barrage. During the morning of the Battle, starting at 5.40a.m., 16 guns fired 140,000 rounds towards the German lines in just 10 minutes. 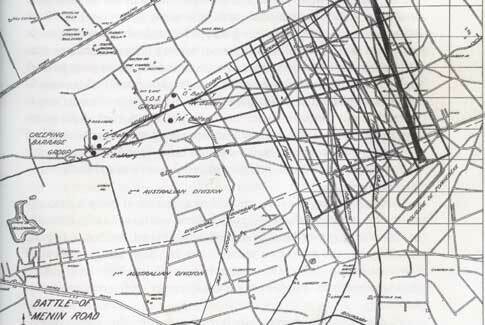 The diagram below shows the area in which the 14th machine Gun Company concentrated its fire power during the lead up to the Battle for Menin Road. 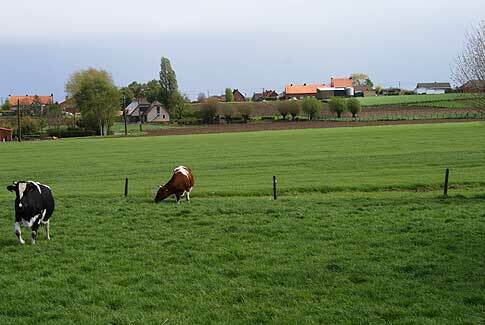 From our position on the Westhoek Ridge, where E Battery was located, we could see across the fields, which were once the battlefields, towards a red roof house in the distance, near the village of Westhoek in Zonnebeke. It was here that Johan was involved in the discovery and exhumation of what was to become known as the Zonnebeke Five. The five were Australian Diggers who had paid the ultimate sacrifice in the fighting near Polygon Wood on 30 Spetember 1917 and had been buried by their mates, lying undisturbed for 91 years. Photo: The resurfaced section of the road where the Zonnebeke Five were discovered. You can read the full story of the Zonnebeke Five on Johan’s website, www.polygonwood.com/. Johan then took me to British New Butte Cemetery to show me their graves. I shook his hand and thanked him for helping the Diggers finally rest in peace. 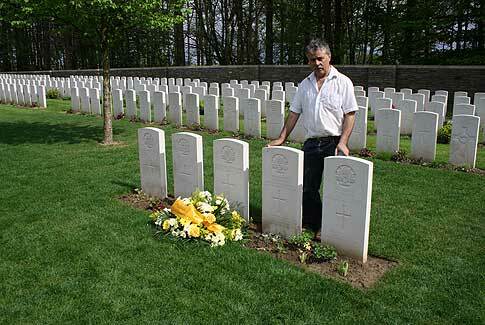 Photo: Johan Vandewalle at the graves of the Zonnebeke Five. The Families and Friends of the First AIF thanks the Australian, UK and French governments for affording Australian and British soldiers – presently buried in mass graves at Pheasant Wood – dignified individual reburials in a new CWGC cemetery at Fromelles, and applauds Minister Snowdon and his British counterpart, Parliamentary Under–Secretary of State for Defence and Minister for Veterans, Kevan Jones MP, for their joint decision to DNA test the remains at exhumation and use every reasonable method to attempt identification of each soldier. This entry was posted in Briefing Room, Polygon Wood, The Western Front. Bookmark the permalink.